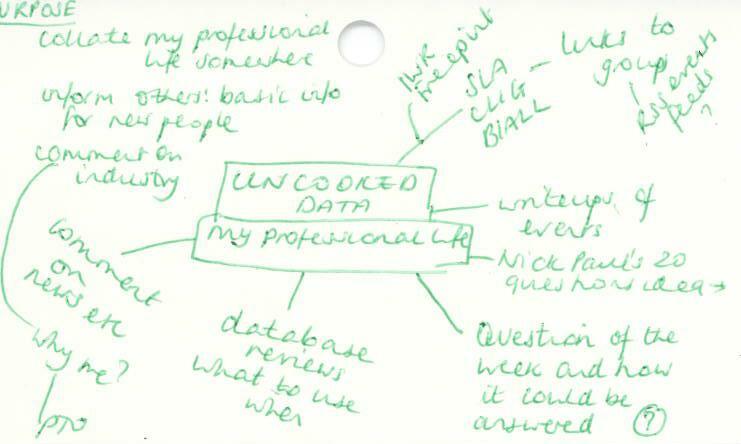 I came across the phrase ‘uncooked data’ in a discussion about new uses of online information and I thought it sounded like a great name for this blog I have been contemplating. I have a blog where I am recording my PhD research, and I also have one where I am ranting about life in general and adding a few lines in about running every now and again. But I didn’t have a space where I recorded, reflected and published my professional life, until now. Ta-Da! See above for the ideas I had whilst on the train home (and yes, that is an old library catalogue card). And so, this is the point of this blog. There are lots of other blogs by librarians. There are lists of librarian bloggers and tweeters to follow should you wish to find them. Some are by library leaders and others are by those with particular niches. My aim for this site is to make it both a place where there are useful links to resources (such as Reed Smith’s Delicious collection I contribute to or professional organisations); answers to interesting research questions I have tackled; links out to other bloggers or discussions and updates on the organisations with which I am involved. This, I think, makes it sufficiently different from the other hundred and twenty gazillion blogs out there.